Politics is broken. What’s The Alternative? March 1st 2017, spring is in the air at Kings Cross Impact Hub. After a challenging winter, new shoots of vitality are appearing as 90 people gather to witness the birth of a new political platform: The Alternative UK. Indra Adnan and Pat Kane co-founders of this bold initiative to reimagine politics welcome us into the space with food and drink. A convivial atmosphere permeates the UK’s first ever political “friendly.” Like a friendly football match Pat tells us we’re gathered for some serious play – perhaps the magic ingredient that’s been missing in contemporary politics. Before the guests settle in to an initial networking session a loud conversation pierces the ‘normality’ of what’s going on room. Two young black actors perform a scene of urban territorial aggression. At the end a chair is smashed on the floor. Society is divided, deformed by an archaic system, as the earth burns we’re pitted against each other, fragmented, unable to co-create a positive future. 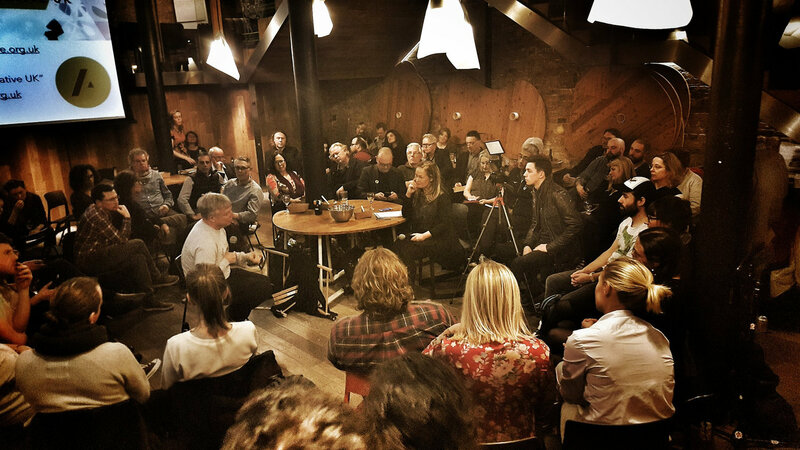 Later the affable Uffe Elbaek, leader of the Danish Alternativet party sits in the centre of the room, recounting the story of what inspired a new approach that has now led to the creation the Alternative UK platform. Fed up with the combative and life-draining culture of the Danish parliament, continually being told, “That’s just the way politics is, you can’t change it” was enough provocation for him to embrace the challenge and see if politics could be reimagined. Starting a party in 2013 that crowdsources its political programme, motivated by the values of courage, empathy, openness, generosity, humility and humour rather than (left or right wing) ideology, Uffe was ridiculed and told his initiative was doomed to failure. In the 2015 Danish election the party surprised everyone gaining 5% of the vote and 9 MPs. The Alternative vision sees society being recreated from the bottom up, through political laboratories where diverse citizens, creatives and entrepreneurs come together to reimagine society and formulate ideas for policy. In Denmark that has taken the form of party and a platform, whilst in the UK due to the limitations of the first-past-the-post system it will start as a platform with the aim of building influence and attraction. The aim is to create an online and offline presence, a network of networks that creatively weaves together three realms: I, We and World. Throughout the evening’s interactive presentations and performances we witness and participate in play, emotion, movement, laughter, song and reflection. Focusing on the ‘I’ realm gives space for people to explore what it is to be fully human. Given the two dimensional nature of our existing social and political structures this approach is designed to liberate the human spirit and potential. The ‘We’ realm highlights how we interact with each other and create community. Annabelle MacFadyen standing behind a stall representing the town of Frome, Somerset shares an example of this. She highlights the Flatpack Democracy revolution that’s happened there since the election of an Independent council, enabling a flourishing and vibrant community life. The ‘World’ realm, as presented by Simon Arnholm, recognises that “There are no domestic problems any more they are all global issues.” Globalisation is not just an issue of evil corporations, its positive message is the story of humanity coming together in a soulful global melting pot. To solve global problems, the Alternative aims to network across national boundaries rather than retreat into them. A core aspect of the evening (and upcoming friendlies and laboratories) is creativity and the generative spirit of artists and performers. It provides a shared felt sense, a glimpse of a human and life-affirming vision of what it means to be. Indra says “We don’t really know what we’re doing.” Many might hear this as a sign of weakness from a movement with political ambitions. I’m wondering if this is not in fact the honest truth of all pioneers setting the agenda and stepping out into the unknown. As the evening draws to a close she invites the youngest people in the room (the future) to comment on the evening. They respond: “For this to mean something don’t just invite your friends – invite your enemies.” It’s a powerful reminder that whatever enthuses liberal minded folk at a gathering in central London also has to win over the hearts and minds of people outside of this bubble for real impact to be made. So What is the Alternative? I left the venue with a sense of it being a daring exploration into the unknowns of creativity, hope, realism, participation and yes that word that’s taboo in politics – “love.” That might just be what’s needed to see us through.